Get your creative kid into tasseography! The ancient art of reading tea leaves to tell the future gets a modern update in this simplified version for youthful fortune tellers! 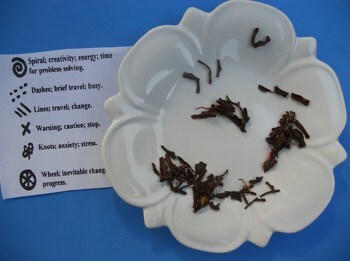 Tasseography is an ancient practise of reading patterns and visual symbols in tea leaves in order to tell a person’s future. “Tass” was a root word meaning “cup” in Arabic. The practise was common in the Middle East, Ancient Greece, and Asia. Later gypsies started tasseography, and it spread to other countries such as Ireland and Eastern Europe. Help your child prepare tea by placing tea leaves in the strainer. Pour hot water over the strainer and into the tea cup. Let tea steep for 2-5 minutes. When the tea is ready, your child should sip it and relax. He needs to prepare mentally for focusing his attention and creativity! When he finishes the tea, help him open the tea strainer to let the tea leaves loose in the cup. Have him swirl the cup three times, then dump leftover tea liquid into the sink, leaving most tea leaves inside the cup. Have him swirl the cup again three times, and then dump the tea leaves onto the white saucer plate. Now he needs to “read” the symbols and visual patterns seen in the leaves. Are there any letters? He should listen to his own instincts to think what the letters might stand for. There is a printable tasseography symbol guide online at , which shows pictures of how the leaves might be arranged. Your child can also come up with his own list of symbols and meanings. Let him be intuitive and creative! He may want to tell fortunes for friends. May the tea leaves be ever in your favor!